The International Public Speaking Competition for Albania has announced the 2016 winner representing Albania in the finals in London. Mr Andorel Ndoj was awarded the first price from over 240 participants. 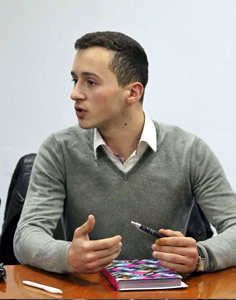 Some of the best entries came from the Independent School in Tirana, Qemal Stafa School in Tirana, Ernest Koliqi in Tirana, New York university, European University of Tirana where Mr. Ndoj is currently studding too, Lezha Academy and many others. We are thankful to all the participants and especially to the jury which had quite a difficult time to award the first price among so many presentations which were diverse but delightful to hear too.